The smell of fresh cut grass, warm sunny days and your hands in the dirt…yes, summer will arrive! The hot summer months can be hard on your garden but proper techniques and tools can keep your garden beautiful. Working for Dramm Corporation, a watering tool company, I have often been asked, “How important is it to water plants?” Watering is extremely important! The reason is that nutrients found naturally in the soil, or even added supplements, are valueless unless they are first dissolved in water. Plants can only assimilate nutrients through their roots as the nutrients dilute. But even more important than watering plants is learning to water wisely. Watering wisely will produce optimum growing for any plants and/or vegetables while saving time and money as well as reducing the strain on the environment. When watering plants, it is best to mimic nature and simulate a natural rainfall for deep root watering. Since 90–98 percent of plant matter is water, the most essential task to ensure healthy plants is to provide sufficient amounts of water. Water applied in small quantities is more harmful than helpful as only the very top layer of soil is moistened, which causes the plant roots to grow to the surface. This subjects the plant to rapid drying and damage. Instead, large quantities of water should be applied in a single application in order to moisten the soil. For flowerbeds and vegetable gardens 1 inch of water is recommended, but be sure to read your plant tag for more precise information on your specific plant. 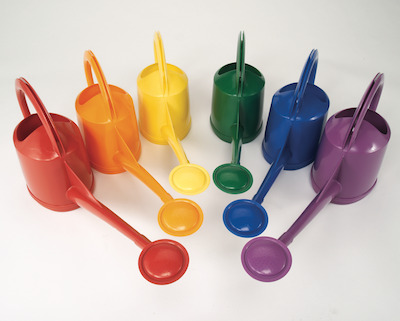 There are many different watering tools available depending on your preference. For watering by hand, I recommend using a Rain Wand™ or a watering can. Either of these tools will greatly minimize water loss from run-off and evaporation. I especially enjoy the Rain Wand™ as it creates a soft shower of rain for plants and as mentioned it is best to mimic nature as closely as possible. You want to aim the Rain Wand™ or other hand watering tool near the soil. This allows the water to go directly to the soil, rather than onto the plant, reducing evaporation on leaf surfaces. Also, applying water at the base of the plant keeps foliage dry to help prevent fungus diseases, such as botrytis and mildew. Choosing a tool with an activated shut-off valve such as Dramm’s One Touch Rain Wand™ ensures water is applied only where needed and saves you water when moving from plant to plant. If you’d rather be sipping on a cold glass of iced tea and enjoying your garden instead of watering, it’s very easy to put a soaker hose around the garden. A soaker hose will ease the burden of watering while still providing sufficient amounts of water that the garden needs. This type of hose is designed to evenly distribute tiny water droplets directly into the root zone of the plant, which reduces water loss due to evaporation. For best results, set the hose around the base of the plants and hook it up to a water timer. For the most accurate results, time how long it takes to fully water your garden, and in the future you simply need to set your water timer to that time and you’re done. Set it and forget it! I do want to stress the importance of purchasing thick, good quality soaker hoses. 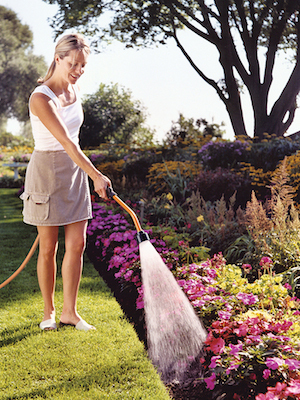 Some soaker hoses have thin walls, which can create “geyser” effects and therefore do not evenly water from the beginning to the end of the hose. I would highly recommend Dramm’s ColorStorm™ Premium Soaker Hose, not that I’m biased, but we have a 50 percent thicker wall and have thoroughly tested our hoses to ensure water is evenly distributed throughout. As you maintain your garden, keep in mind your plants’ watering needs; and above all else, choose plants and watering tools that are fun and suit your garden and your personality. Happy Gardening!